COLUMBIA FALLS, Mont. – The new $9.5 million biofilter at Plum Creek’s fiberboard plant in Columbia Falls already has “bugs” in its system – about 4 trillion. Plum Creek Timber Co. employees and U.S Rep. Denny Rehberg, R-Mont., gathered this month to unveil the medium density fiberboard plant’s “bug farm” – a high-tech system that houses approximately 4 trillion microscopic bacteria that clean the air of chemicals released during the manufacturing process. The MDF “bug farm” is the third, and largest, biofilter installed by Plum Creek in Montana and the largest such system in the world, according to Plum Creek officials. Biofilters are also treating emissions at Evergreen’s plywood plant and on the MDF plant’s second production line. 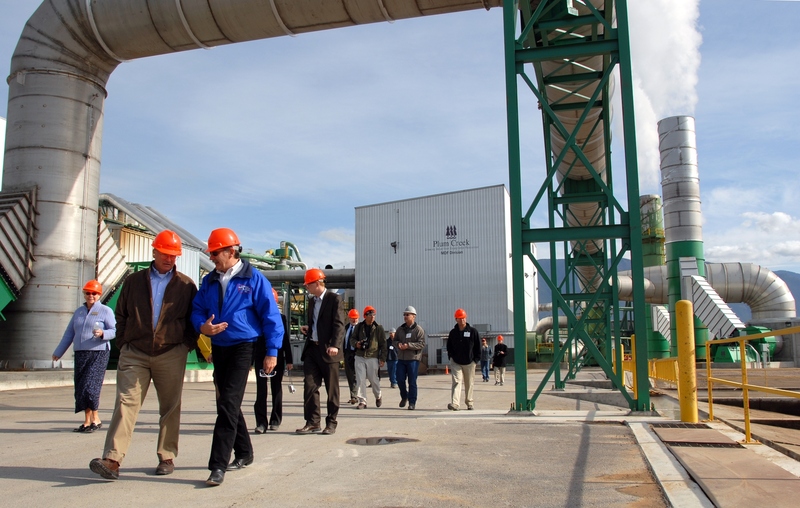 Evergreen’s biofilter, which is about one-tenth the size of its Columbia Falls counterpart, also started in September. The biofilters were installed in anticipation of increasing Environmental Protection Agency regulations, Henry Ricklefs, vice president of northern resources and manufacturing, said. The biofilter removes at least 98 percent of chemicals, such as formaldehyde and methanol, from the plant’s emissions. The massive, temperature-controlled concrete bunker that makes up the outside of the biofilter covers about one-acre. Stainless steel ducts – the largest is 16 feet in diameter – force the air emissions into the main well of the bunker where about 11,000 gallons of recycled water moisten the air. The air then filters into one of four beds where fans push it down through several feet of rocks that host the single-cell bacteria. The bacteria eat the chemicals in the air and exhale carbon dioxide and water. Temperature and humidity are closely controlled to ensure the bacteria can sustain a healthy colony. With about 4 trillion microorganisms in the system, the biofilter cleans about 9,000 cubic feet of air per minute – or the equivalent of all the air inside a 2,000 square foot house every second. But the incinerators, because they use natural gas, create their own emissions while cleaning the air and cost more over their lifetime. The biggest challenges to the biofilter project, Ricklefs said, were escalating construction and material costs, especially stainless steel. Each foot of the giant steel duct that leads into the filter cost $30,000 alone, he added. Rehberg praised Plum Creek for investing in the new technology, despite the expense.